JFK arrived at Northwestern University’s Abbott Hall midshipman training course run by the United States Navy. The design of the course was to produce sea-worthy naval officers in 60 days, a product met with derision by many enlisted sailors. 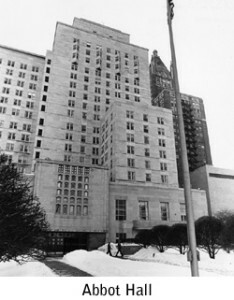 Abbott Hall of Northwestern University was used by the United States Navy to house naval officers .